Bike Fun yesterday straddled the realms of urban planning and traffic engineering. 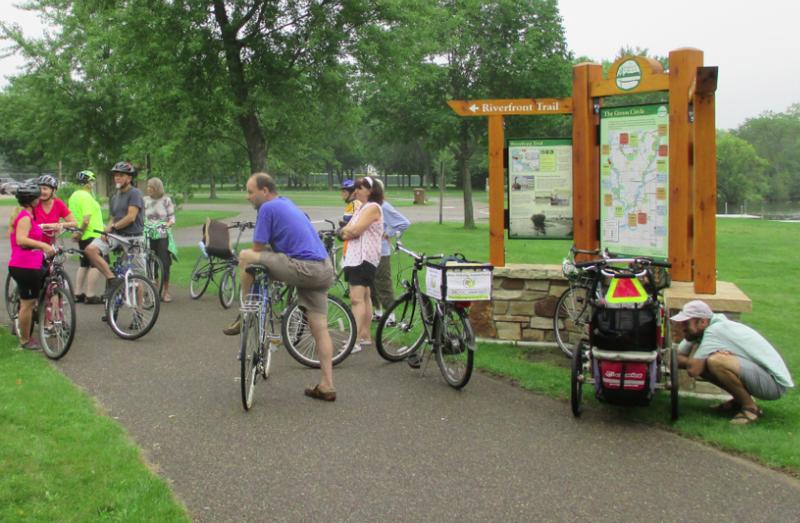 The Bike/Ped Plan Vision Ride allowed Poky Pedalers to visualize how much better biking and walking will be once the Portage County Bicycle and Pedestrian Plan is implemented. Dark gray skies and a very light mist greeted us as we assembled at Bukolt Park. Nevertheless, it turned out to be a very pleasant afternoon for bicycling – not too warm, not too cool, and not too wet – for the 13 Poky Pedalers who set forth to learn what the bike/ped plan is all about. Our 11-mile route took us to 14 locations where we assessed current conditions and learned what the bike/ped plan recommends to improve biking and walking. A handout with images helped Poky Pedalers understand the many types of innovative accommodations recommended by the plan. 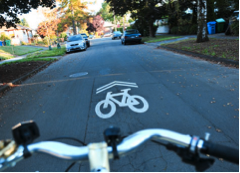 bicycle boulevard on Prais St.
an overview of the Safe Routes to School portion of the plan that makes recommendations for each of the 23 K-12 schools in Portage County. a biking and walking bridge across the Plover River connecting Hofmeister Dr (where the Green Circle Trail along the northwest bank of the Plover River can be accessed) to the area behind Target on Golla Rd – this would give a great alternative to the current terrible connection along Main St/Hwy 10 over I-39. Through the many topics we discussed, Poky Pedalers gained a better understanding about the Portage County Bicycle and Pedestrian Plan. 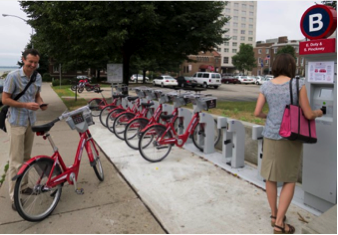 Our Poky Pedal inspired a vision of a better place for Poky Pedalers to live. In case you didn’t join us yesterday, you can download the 12-page pamphlet handed out during the ride. This page describes the contents of the pamphlet and contains a link for downloading it. Among the information it includes, it lists the locations we visited and the plan recommendations at each. Thus, you can use the pamphlet to recreate an approximation to our route. I can’t promise such a route recreation will provide as much Bike Fun as being on the Bike/Ped Plan Vision Ride itself, but I encourage Poky Pedalers to find out for themselves. The remaining opportunities for Bike Fun with PPSP this year are few. So Poky Pedalers certainly won’t want to miss the Poky Pedals in September and October. You can get info about these via the Upcoming Poky Pedals page and the 2014 Bike Fun Calendar.